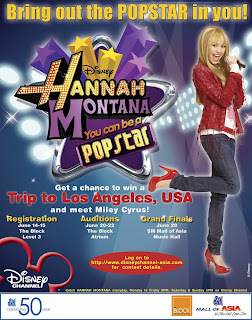 Hannah Montana You can be a Pop Star Contest! ~ Philippine Freebies, Promos, Contests and MORE! Hannah Montana You can be a Pop Star Contest! Does your child have the Hannah Montana charm in her? Then don't miss the opportunity to join the Hannah Montana You can be a Pop Star Contest! Yes, your child (or sibling) can be a pop star and win a 3 days 2 nights Trip to Los Angeles inclusive of Pop star activities and pampering! Entry to the Contest is open to children both girls and boys in the Philippines aged 7 to 14 (as of 14th June 2008). Contest is open to amateur performers only. Log on to www.disneychannel-asia.com to find out more about the official rules of the contest. Print out the entry & release forms from the website. Proof of identity and date of birth documents is required for the registration. You will need to register for the contest in person at the registration venue with one parent or legal guardian aged 21 or above. Go down to SM City North EDSA Mall, The Block, Level 3 in person together with one parent or legal guardian aged 21 or above, on either 14th or 15th June 08 (during mall opening hours) to register your entry with us at the registration counter. Each of the consolation prize winners will get an exclusive Hannah Montana Goodie bag. Only the first 500 eligible children who successfully register with Disney in accordance with these Official Rules will qualify for the Contest auditions. Very nice prize for the winner!